A variety of things can degrade the signal. These include large trees, structural beams and dense building materials, such as bricks. A few unlucky people might live on the outskirts of a signal, or populate a small space carriers refer to as “black holes”. People in rural areas often endure the brunt of poor reception simply because carriers aren’t as enthusiastic about infrastructure support. Apple presented one way to circumvent this problem with its Wi-Fi calling, however a lack of support by carriers has seen this breakthrough fall on deaf ears. Those suffering the plight of poor cellular signals can invest in different technologies designed to boost signal quality. One of which is the Cel-Fi Smart Repeater. Two parts make up Cel-Fi’s repeater system. The company refers to the first part as a window unit because it is meant to be placed in the room with the best possible cellular signal. Windows do the least damage to a cellular signal, which is why Cel-Fi advocate the router-like device’s placement near one. Figuring out the room with the best reception relies on an old-school technique. Grab your phone and wonder rooms with your eyes fixed on your smartphone’s signal. The window unit can pick up a 3G signal as weak as one bar, and it supports an external antenna in extreme cases. It looks like a small computer tower that stands roughly 20 cm tall. Setting it up is as easy as plugging it in and monitoring the strength of the signal displayed on its front. The window unit will broadcast a 3G signal to the secondary coverage unit. This is much smaller — more like a modem-router — and is to be placed as far as possible from its counterpart. The coverage unit presents a score ranging from zero to eight, with eight being the goal. That’s all it takes for installation. Cel-Fi’s system is the only one of its kind approved by Australia’s three largest carriers: Vodafone, Telstra and Optus. A few points warrant consideration before you drop the $822 asking price. •Cel-Fi’s RS2 is carrier specific. This means a single unit will work with a single carrier, and not all three. Families will likely have to sign up to the same carrier plan, though this isn’t much of a compromise as carriers often discount calls and texts between customers. 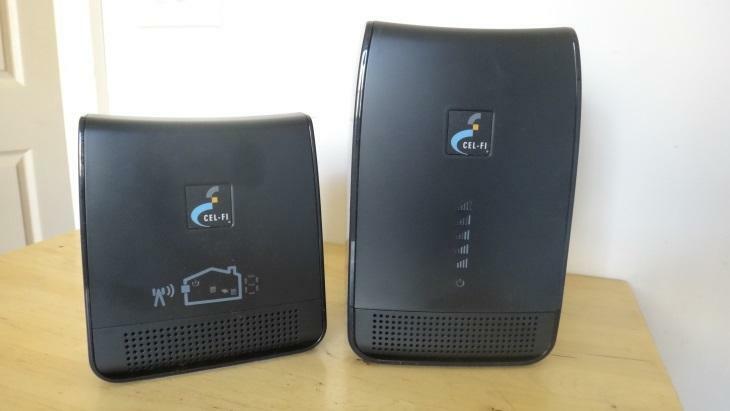 • The Cel-Fi RS2 will not improve 4G networks. The RS2 only works with 2G and 3G networks. Those interested in boosting a 4G signal can wait for the next generation model, which representatives claim will be out in the first quarter of 2015. • Existing models are not upgradable. The RS2 won’t support 4G in the future. Cel-Fi’s RS2 is available now from Kogan.